Cheesemaker Patricia Morford of Rivers Edge Chevre fulfilled a long-held dream when she started making cheese from the milk of her small herd of Alpine goats. Pat grew up with goats, originally keeping just one to provide fresh milk for her family, and gradually established her own herd and cheesemaking facility in the foothills of the Oregon Coast Range. 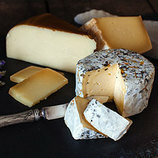 Pat, along with her daughters, now makes a range of award-winning fresh and aged cheeses, and the quality of the herd's milk shines through in all of them. 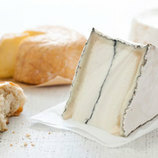 Sunset Bay is a unique, beautiful two-pound wheel of goat cheese that has a thin layer of Spanish pimentón running through its center. The paprika imparts a delicate smoky flavor that melds perfectly with the cheese’s rich, creamy, pleasantly salty paste. The entire wheel is dusted with ash and then allowed to grow a delicate bloomy rind. 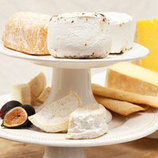 Pair this cheese with a glass of Spanish cava and a handful of Marcona almonds.